Description: As a result of the fall of Forts Henry and Donelson, Confederate Gen. Albert Sidney Johnston, the commander in the area, was forced to fall back, giving up Kentucky and much of West and Middle Tennessee. He chose Corinth, Mississippi, a major transportation center, as the staging area for an offensive against Maj. Gen. Ulysses S. Grant and his Army of the Tennessee; before the Army of the Ohio, under Maj. Gen. Don Carlos Buell, could join Grant. The Confederate retrenchment was a surprise, although a pleasant one, to the Union forces. 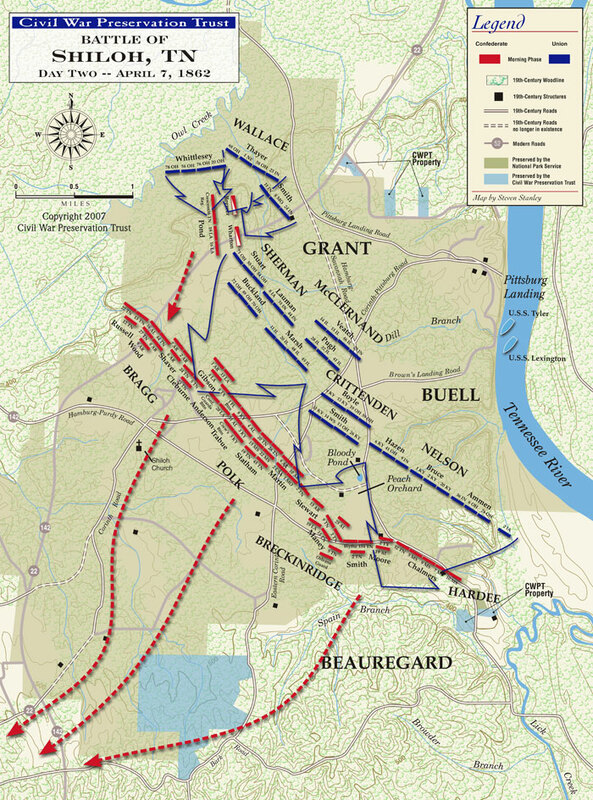 Adjacent the Tennessee River, Grant and approximately 40,000 men needed time to mount a southern offensive toward Pittsburg Landing. Grant received orders to await Buell’s Army of the Ohio at Pittsburg Landing. Grant, consequently, did not fortify his position; since many of his men were raw recruits, “Grant had his men drilling. “ Johnston originally planned to attack Grant on April 4th, but delays postponed it until the 6th. 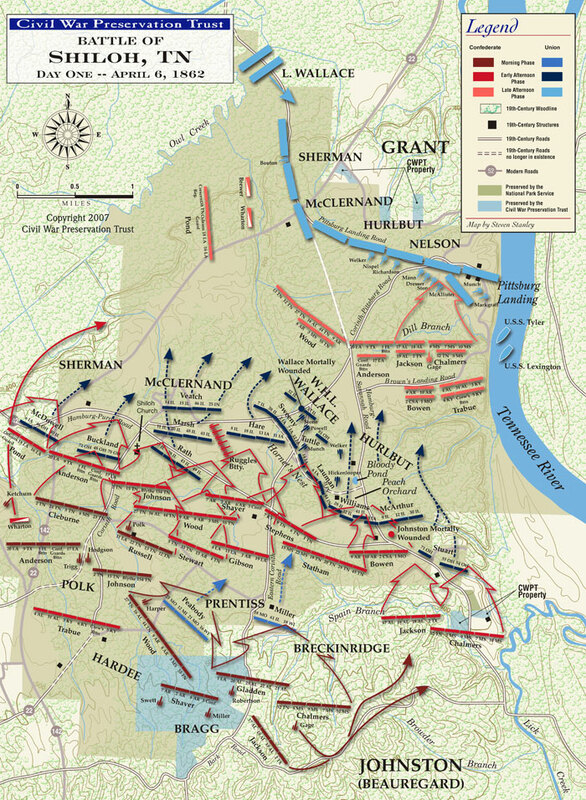 Attacking the Union troops on the morning of the 6th, the Confederates surprised and routed many of them. Some Federal units, however, made a determined stand and by afternoon they had established a battle line at the sunken road, known as the “Hornets Nest.” Repeated Rebel attacks failed to carry the Hornets Nest, but massed artillery helped to turn the tide as Confederates surrounded and captured, killed, or wounded most of the Federals. Johnston had been mortally wounded earlier and his second in command, Gen. P.G.T. Beauregard, assumed command. The Union troops established another line covering Pittsburg Landing, anchored with artillery and augmented by Buell’s men who began to arrive and take up positions. Fighting continued until after dark, but the Federals held. Aftermath: In the immediate aftermath of the battle, Northern newspapers vilified Grant for his performance during the battle on April 6. Reporters, many far from the battle, spread the story that Grant had been drunk, falsely alleging that this had resulted in many of his men being bayoneted in their tents because of a lack of defensive preparedness. Despite the Union victory, Grant's reputation suffered in Northern public opinion. Many credited Buell with taking control of the broken Union forces and leading them to victory on April 7. Calls for Grant's removal overwhelmed the White House. President Lincoln replied with one of his most famous quotations about Grant: "I can't spare this man; he fights." Sherman emerged as an immediate hero, his steadfastness under fire and amid chaos atoning for his previous melancholy and his defensive lapses preceding the battle. Today, however, Grant is recognized positively for the clear judgment he was able to retain under the strenuous circumstances, and his ability to perceive the larger tactical picture that ultimately resulted in victory on the second day. Sources: National Park Service; 1913 Report of the Shiloh National Military Park Commission; Shiloh National Military Park; Official Records of the Union and Confederate Armies; Civil War Preservation Trust; Cunningham, O. Edward, Shiloh and the Western Campaign of 1862 (edited by Gary Joiner and Timothy Smith), Savas Beatie, 2007, ISBN 978-1-932714-27-2; Daniel, Larry J., Shiloh: The Battle that Changed the Civil War, Simon and Schuster, 1997, ISBN 0-684-83857-5; Eicher, David J., The Longest Night: A Military History of the Civil War, Simon & Schuster, 2001, ISBN 0-684-84944-5; Esposito, Vincent J., West Point Atlas of American Wars, Frederick A. Praeger, 1959; Grant, Ulysses S., Personal Memoirs of U. S. Grant, Charles L. Webster & Company, 1885–86, ISBN 0-914427-67-9; Grimsley, Mark, and Woodworth, Steven E., Shiloh: A Battlefield Guide, University of Nebraska Press, 2006, ISBN 0-8032-7100-X; Hanson, Victor Davis, Ripples of Battle: How Wars of the Past Still Determine How We Fight, How We Live, and How We Think, Doubleday, 2003, ISBN 0-385-50400-4; McDonough, James L., "Battle of Shiloh", Encyclopedia of the American Civil War: A Political, Social, and Military History, Heidler, David S., and Heidler, Jeanne T., eds., W. W. Norton & Company, 2000, ISBN 0-393-04758-X; Nevin, David, and the Editors of Time-Life Books, The Road to Shiloh: Early Battles in the West, Time-Life Books, 1983, ISBN 0-8094-4716-9; McPherson, James M., Battle Cry of Freedom: The Civil War Era (Oxford History of the United States), Oxford University Press, 1988, ISBN 0-19-503863-0; Smith, Jean Edward, Grant, Simon and Shuster, 2001, ISBN 0-684-84927-5; Sword, Wiley, Shiloh: Bloody April, Morningside Books, 1974, ISBN 0-89029-770-3; Woodworth, Steven E., ed., Grant's Lieutenants: From Cairo to Vicksburg, University Press of Kansas, 2001, ISBN 0-7006-1127-4; Woodworth, Steven E., Nothing but Victory: The Army of the Tennessee, 1861 – 1865, Alfred A. Knopf, 2005, ISBN 0-375-41218-2.